Holiday dining leaves many leftovers and the temptation to over feed your pet. 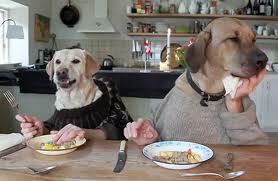 Give your dog table food sparingly, too much can be bad for their digestion. As your dog gets older it may be necessary to add supplements to their diet to keep them healthy. Do your homework there are many products to choose from. When buying dog food it is important to do your homework. Do not buy anything which has ingredients from China. Buy USA only! !